If you thought that story was odd, here’s another even less explicable. I named it the Grandpa plant until I could find out what it was really called. I love having plants that remind me of special people. I have Yvonne’s lily and Marlene’s philodendron and my mom-in-law’s Bethlehem sage and Cynthia’s spider plant and April’s creeping jenny and Aunt Rose’s oregano and the kids’ columbine and Sherry’s cilantro… and so many more. Even after I knew this one was technically “purple shamrock,” I called it “the Grandpa plant” for short. Kind of like how Robert goes by Bob. I enjoyed it for several years, and watched it grow. That was the story of the Grandpa plant until this spring, when I brought all my houseplants into the laundry room for their great annual shake-up – pruning, transplanting, and regrouping. I had noticed the Grandpa plant was not doing as well as I would have liked in its deep crock; it had grown better when it was cramped. I dug out all the roots (there were a surprising number of them, like mini bulbs), and placed them carefully into a smaller, shallower pot. Then I put the collection by a window – a different window, which was my big mistake. Every stem keeled over and bit the dust, and only one of the bulbs produced a new shoot, a baby thing of hopeful promise until it, too, collapsed. I was horrified. I’d killed the Grandpa plant, and now it was gone. 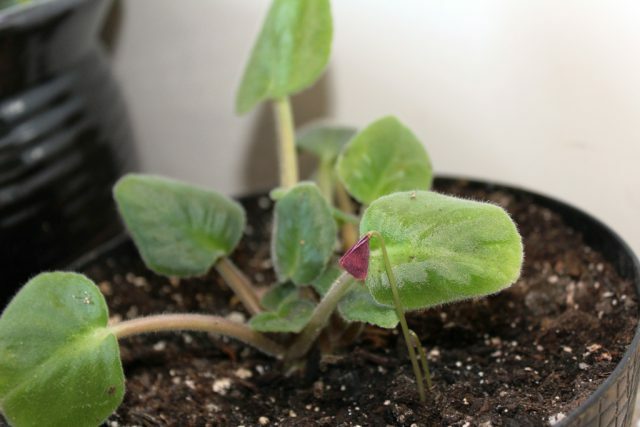 Several weeks later, as I filled a jug of water at my laundry room sink, I saw something odd coming up in my African violet pot. You won’t believe this, but it was purple shamrock – the Grandpa plant – just two little curls of leaf, sturdy and determined. I watched it grow, delightedly. 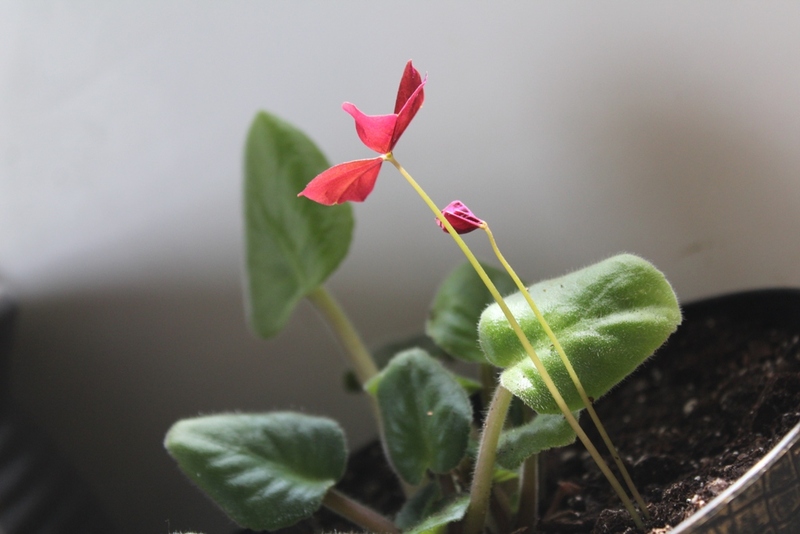 Soon it had five stems or more, and one day as I looked at how the leaves of the shamrock intertwined with the leaves of the African violet, my eyes opened wide. That violet came from my grandma. I like to think of him in heaven, and her in Ohio, and their plant starts twining together beside my sink. Those shamrocks are hardy guys! I just decided to euthanize my old leggy one and replace it with a fresh young upstart. Lo and behold, it resurrected into a lovely compact little plant at the edge of the garden! It has a good chance of getting welcomed back into our home this fall if it maintains a good conduct grade all summer. I like the outdoors idea on the shamrock. I’m always scared to hurt my houseplants by taking them outside, but it would probably do them good. That is such a sweet story. Love it. I love how God throws little surprises like that into our lives, like He’s reminding us not to get too caught up in our busy, gotta-do-the-next-thing, sometimes mundane days. Almost all of my houseplants are starts from other people too. And then it’s so fun to divide them and give baby ones away in Goodwill teacups to someone else. I bet your Grandma loves that story. I love the teacup idea! Aw, the story gave me chills! I love it– and the beauty of the plants. I have gifts of plants that I tenderly care for, and think of the people who gave them to me. I dragged 60 tender starts to my new home, and prayed over each one as I planted it. Thanks for telling that neat story! I too have plants from my grandma and my grandpa gave me daffodil bulbs after Grandma died. I do not have houseplants though… Unfortunately I don’t seem to have the knack or the right windows for them. 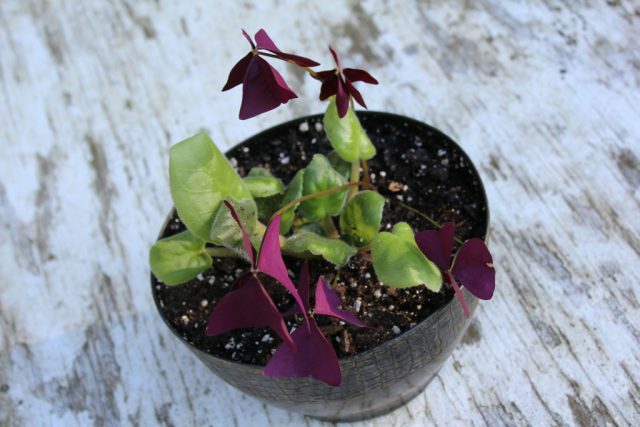 What a sweet story…purple shamrock should be hardy outdoors to zone 4. It’s a delightful plant to have pop up in spring, beside something chartreuse! Ooh. You’re talking my language. 🙂 That I will have to try! It’s fortunate you still have a good brain. Me..I name plants after who gave it to me or who I got the start from, but unfortunately, I usually can’t remember these details after about the first year I plant it. Maybe having hundreds of plants has something to do with it 🙁 I laughed at Renita’s comment about bringing 60 plants from her old home to her new. When we moved to Idaho, I filled all the space around the flat bed trailer that our tractor was moved on with pots of plants. It was quite a sight as it rumbled down the freeway. We didn’t buy a place for a few months so I nursed them all through the hot summer in pots and finally replanted and am now enjoying a lot of plants from our old place. I love the story of your Grandpa and Grandma’s plants. I have been thinking that I want to go over and get some starts from my in-laws’ yard in memory of them (they were killed in a car accident last year).